I finally got around to tracking download statistics on Board Off design tool and I was very pleasantly surprised to see that it is being downloaded about 30 times a month for the last 2 months! I wasn't sure it was being downloaded at all was very happy to know that its it out there. What's also very cool is that it shows how global our community is. 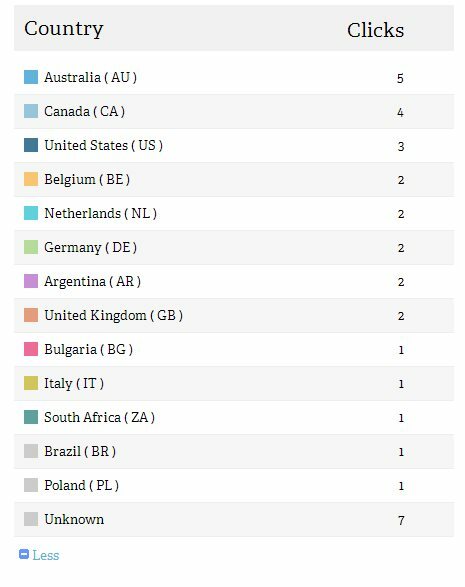 Here's the downloads from March by country. Bit.ly is tracking the number of time the download link (downloads from public dropbox folder) is clicked so the stats are accurate. If you're a user of BoardOff would be great to hear from you about what can be done to make it better and more user friendly.